Poll: Should the use of posters during election campaigns be scrapped? One presidential candidate already said they won’t use posters during their campaign. IT’S NOW ONE month until Ireland goes to the polls for this year’s Presidential election, which means candidates’ posters can now start to be displayed. The posters are a familiar sight across Ireland during election season, but can cost hundreds of thousands of Euro for candidates and parties. 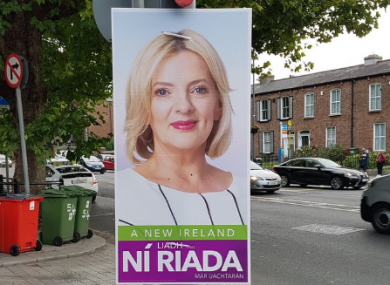 The first posters, belonging to Sinn Féin’s Liadh Ní Riada, were spotted around Dublin earlier today. However, Independent senator Joan Freeman has said she wouldn’t use them. We want to know whether other candidates should follow her lead: Should election posters be scrapped? Email “Poll: Should the use of posters during election campaigns be scrapped?”. Feedback on “Poll: Should the use of posters during election campaigns be scrapped?”.